David Packer’s sculpture and work on paper challenge our preconceived notions of the world by visually integrating two specific interests, industry and the natural world. 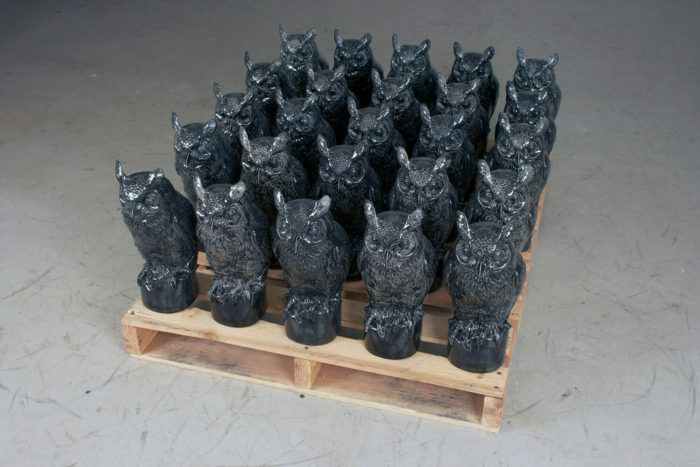 The sculptures embrace what appears at first sight to be everyday, recognizable objects, such as plastic water bottles, car engines, trains, bears, dogs and owls. These vernacular subjects, sometimes reconfigured with new media, sometimes built with found objects are transformed into objects that resonant with more complex associations. Ceramic, new or recycled wood and found objects, often with monochromatic color treatments and thematic repetition, are all combined in imaginative and challenging ways. The use of industrial imagery, techniques and materials invite a conversation about the environment in which we live. Utilizing popular culture’s constant flow of throw away imagery, David’s work on paper locates and portrays us in today’s multimedia world, as photographic images and found material are considered and combined in a sculptural and physical manner. Diaristic or serial in format, defined by time and/or place, the work is collated together in book or portfolio form. Each medium that David explores shifts and resonates, allowing his art to evoke multiple responses and feelings, moving from the specific to include a wider world view. David Packer was born in the UK and received his BA from the Bristol School of Art in the United Kingdom and his MFA in Studio Art from Florida State University in 1994. His work has been included in one person and group shows at Garth Clark Gallery (New York), Lyons Weir Ortt (New York), Exit Art (New York), Navta Schulz (Chicago) and Barbara Greene Gallery (Miami). He was awarded a Fulbright Research Fellowship in ceramic sculpture to Morocco, a Time Warner Arts Fellowship, a New York State Artist award, and residency fellowships at the MacDowell Colony (New Hampshire), Yaddo (New York), the Kohler Arts/Industry program (Wisconsin) and Youkobo (Tokyo, Japan). David’s work is included in the permanent collections of the Museum of Art and Design (New York), Carnegie Museum of Art (Pittsburgh), as well as numerous private collections. He has created large scale, site-specific art commissions for the Wolfsonian Foundation and Museum (Miami) and the city of Bellevue (Washington). David has lectured and taught at Greenwich House Pottery (New York) and the MFA program of Western Carolina University (North Carolina). David divides his time between New York City and Long Island City, and is an avid traveler and reader of fiction. 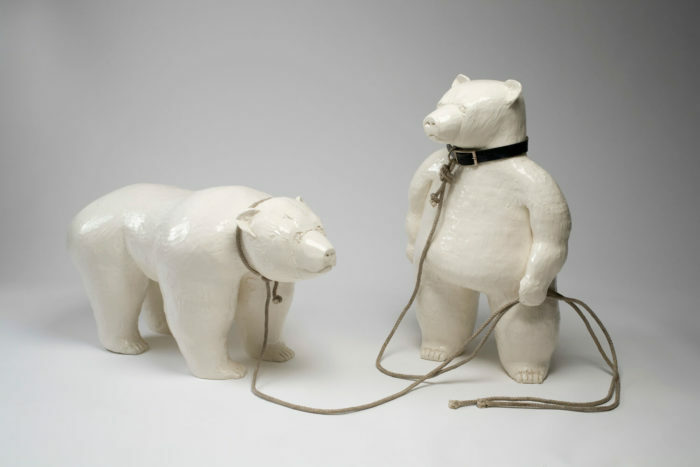 David Packer, "Bears that Dance", glazed ceramic, 2009. 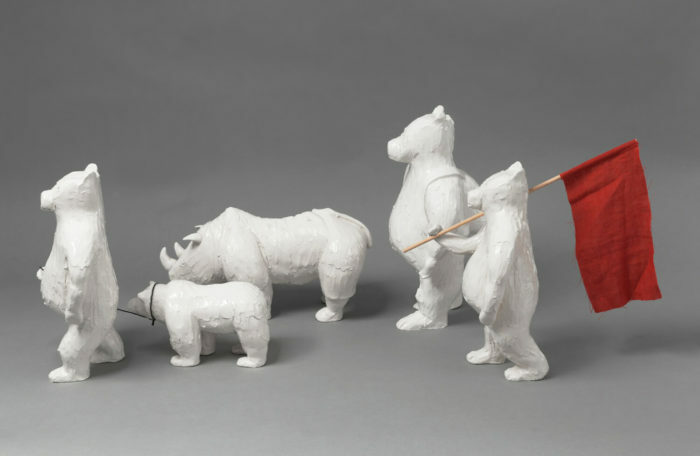 David Packer, "Pilgrimage" glazed ceramic, 12 in (30 cm) high each, 2018. 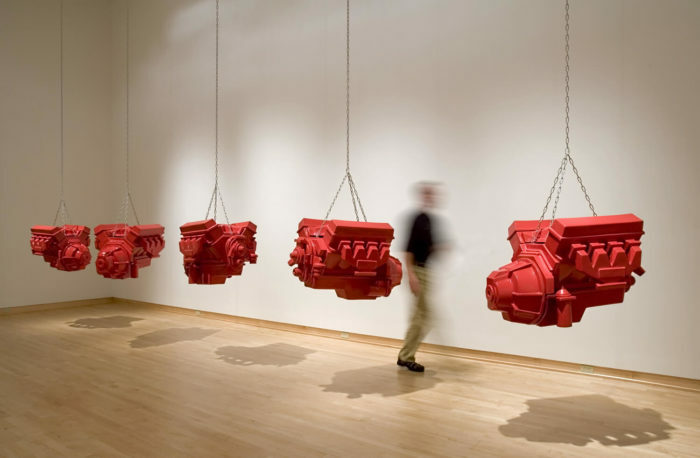 David Packer, "The Last of the V8s", painted ceramic, 2006. David Packer, "Short Circuit", cast and glazed ceramic, 2011. 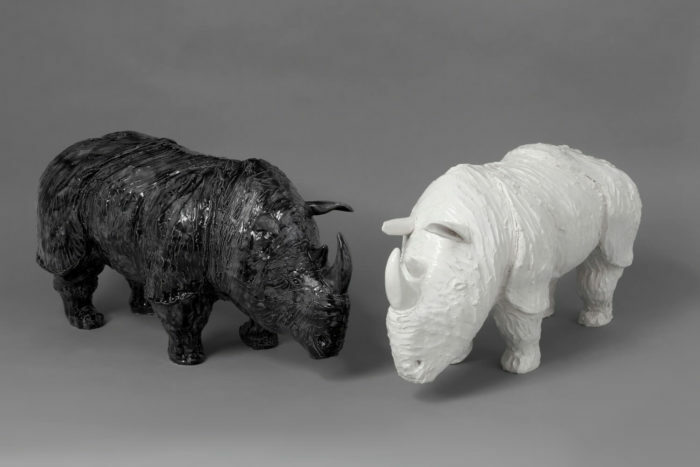 David Packer, "Black and White", glazed ceramic, 2017. 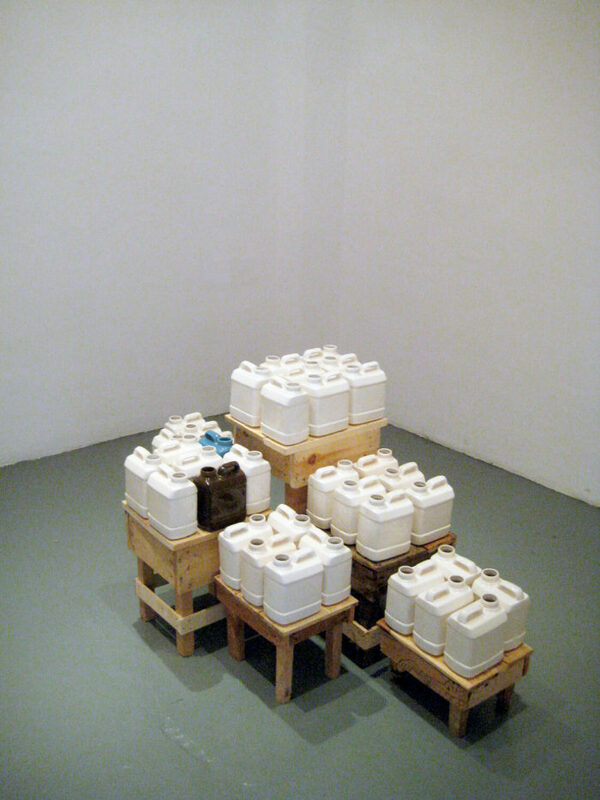 David Packer, "Bidons", glazed ceramic with wood, 2012.